I cast some scrap wood chunks into epoxy resin and turned it into a bowl on the lathe. This was a fun learning experience and has definitely got me wanting to do more with epoxy casting! Check out Woodpeckers Ultra-Shear carbide turning tools. I started this project with this popcorn bowl from the dollar store. This bowl was just about the exact size I was looking for and was perfect for a mold for this project. Next, it was time to raid my drawer of random scrap cut-offs. These have been in this drawer forever, and most of them are really too small to do much of anything with. They were perfect for this project. Instead of cutting some of the pieces into smaller chunks, I figured breaking them apart would look cool. Peter Brown did an awesome secret wood bowl where he broke off pieces and I thought I would try something similar. He broke his pieces across the grain, which requires a lot more work as it turns out, so I just broke them with the grain to save some energy. Next, I needed to create a waste block, which would serve two purposes. First, it would take up extra volume in the bowl, which would save a lot of money in epoxy. Second, it would give me a place to mount a worm screw, so I could mount the bowl on the lathe after the epoxy pour. I cut a few pieces of scrap Pine and glued them together, drilled a hole in the center for the worm screw, then cut off the corners, although that wasn’t really necessary in retrospect. Next, I filled the bowl with the pieces of scrap wood, making sure they completely surrounded the waste block. I packed them in pretty tightly, but I didn’t want to deform the plastic bowl too much. I also made sure to orient the grain direction of all of the pieces in the same direction, so they were more predictable when turning. Once I was satisfied with the way everything looked, I added some painter’s tape to keep the wood from floating when I added the epoxy. For the epoxy on this project, I used some of the leftover Ecopoxy Liquid Plastic from my river headboard build, and one of the big advantages of this epoxy is that you can pour it at basically any depth. I mixed 3 liters of the epoxy in total, using a 2 to 1 ratio of resin to hardener. Next, I added some blue and green pigment, along with some pearl pigment, and then stirred the epoxy well. It has an extremely long open time, so there’s no rush, which is nice. After mixing, I could go ahead and pour the epoxy into the bowl, which went smoothly. 3 liters ended up being exactly how much I needed, as luck would have it, so I didn’t end up wasting any epoxy. One thing I should have done was let the epoxy sit for a few minutes after mixing, to let the bubbles rise to the surface. This epoxy takes a few days to cure, so most of the bubbles went away on their own, but I could have done a better job of getting them out before the pour. After pouring, I let the epoxy cure for three days and then I could remove it from the mold. 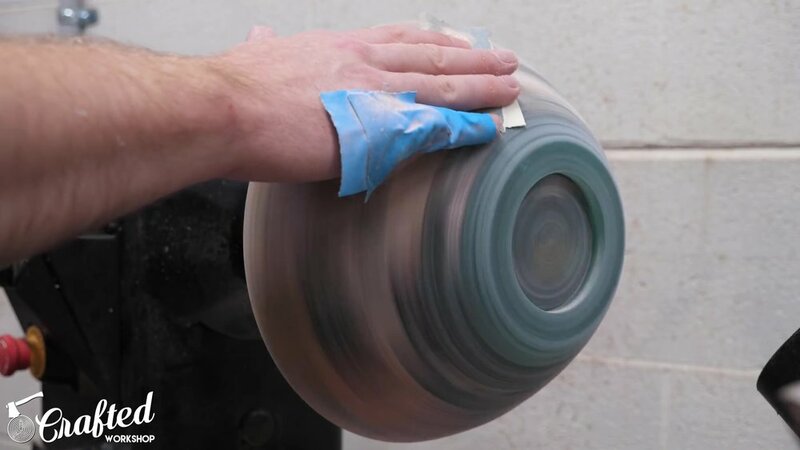 The color looked pretty dark when I removed the blank, but I knew it would look a lot lighter once the bowl was turned. Next, I mounted the bowl on the lathe using the hole I drilled earlier for the worm screw. In retrospect, I should have drilled this hole after the epoxy pour, as the waste block was a little bit off center, which meant the bowl was pretty out of round when I first mounted it on the lathe. This wasn’t a huge deal, because I wanted to remove the outer layer of epoxy to expose the wood anyway, but it would have saved me a little hassle if I drilled the hole based on where the waste block was after the pour. Because the bowl was so out of round, I had to start at a really slow RPM to avoid too much vibration, around 500 rpm. Epoxy is really prone to chipping at this low of speed, but I just had to get through this part before I could turn the speed up. Some of the chips actually ended up cutting my finger, so I put some gaffer’s tape over my pinky to avoid this. My shop looked like the set of Breaking Bad after this rough turning, there were chunks of light blue transparent pieces all over the place. 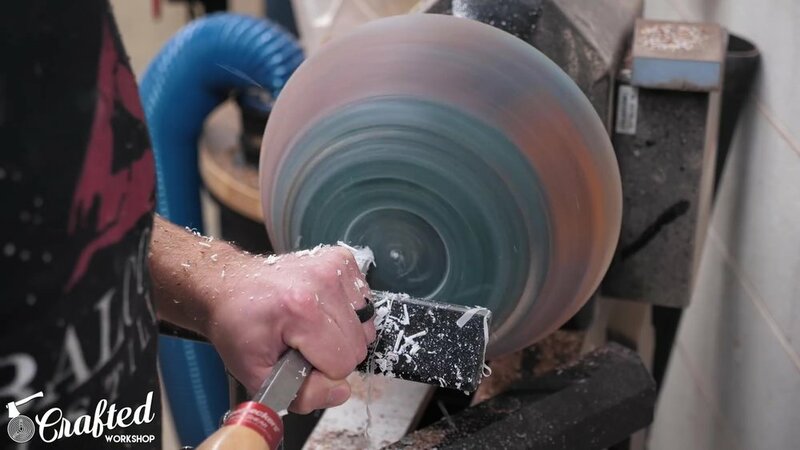 After roughing out the outside of the bowl, I evened up the top of the bowl to get the bowl totally balanced on the lathe, then I could crank the speed up and start getting some nicer shavings. I also went ahead and cut a mortise into the bottom of the bowl so the bowl could be mounted to the chuck later on. With the rough shaping done, I could really start to focus on cleaning up the chip out and refining the shape of the bowl. I used my Woodpeckers carbide turning tools for this project, and they were great at smoothing out the surface of the epoxy. I made a few shearing cuts on the outside of the bowl to get them really nice and clean. With the bowl as smooth as it was going to get with the turning tools, I moved on to sanding, working my way through the grits up to 600 grit. Between each grit, I wiped the surface down with mineral spirits to remove the excess epoxy dust. I finished the outside of the bowl with a friction finish, but I ended up having to redo this later due to the bowl launching off the lathe a few times, so I’m going to skip through this part. Once the finish was applied, I removed the bowl from the worm screw and mounted it to the lathe using the chuck. This is where things got a little frustrating. As you can see, I almost immediately launched the bowl off the lathe after spending all of that time sanding and finishing, but luckily there wasn’t much damage since it was still a solid piece. I proceeded a little more cautiously, with the tailstock in place to provide extra support, and starting clearing out the bulk of the inside of the bowl. I was having a pretty hard time during this process, with the tool wanting to grab a lot, and I ended up launching the bowl again, but this time it did a little more damage. It cracked the rim of the bowl, which I stabilized with CA glue off camera. I decided it was time to stop for the day at that point, so I could regroup and figure out what was going on. After talking with Peter Brown, who has turned a whole lot more epoxy than me, he advised me to turn my speed way up, which helped tremendously. He recommended somewhere between 1500 and 1800 RPM, which seemed like a good sweet spot for me. As you can see, I was getting much better results at that higher speed, getting nice little shavings even though I was turning mostly end grain at this point. With my confidence back, I kept removing material until I got to the shape I wanted and a wall thickness of about ½”. I switched to the shearing cut to clean up all of the faces, which worked really well, especially on the epoxy, and then I could get back to sanding. I picked up one of these sanding wheels, which attach to a regular drill and speed up the process the sanding process quite a bit. I moved up through the grits, going up to 600, and then switched to these sanding pads which I got from Rockler. They go all the way up to 12,000 grit, and are designed for acrylic and other types of plastic. I worked my way up through the grits, wiping the piece down with a rag between grits, before applying finish. I went with simple wipe-on poly for this bowl, and it ended up working well. I kind of wish I had gone with a glossier finish, but I still think it turned out nice. With the finish applied, the bowl was done!